This is my idea of a still life. See, I don't just paint portraits. One day I might paint a landscape as well. This is amazing, I love it. 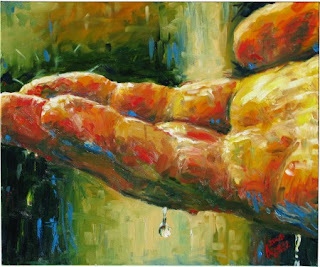 I'm not usually moved by art, but that single drop under the hand does it for me. Fantastic stuff. Thanks chipoosheet. That's the main reason I've moved to painting from photograph. You can capture the moment (or the emotion) and then get down to sticking some oily pigment on some cloth.